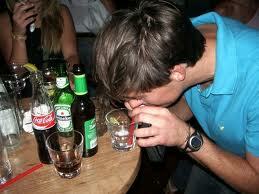 Some people really enjoy the feeling of being drunk, but hate having to do all that pesky drinking. Maybe they don’t want the calories. Maybe they don’t like the taste. Maybe they’re in a hurry, and the normal metabolic process is a waste of time. Regardless, the lengths to which some will go to get their swerve on provides a unique and truly chilling look at humanity. You’ve made it through the long week, it’s the weekend and it’s time for Happy Hour, Gizmodo’s booze column. A cocktail shaker full of innovation, science, and alcohol. Let’s just drink through our mouths, like normal! This should go without saying, but we’re going to say it anyway: Don’t do any of these things. Seriously. They are all very, very stupid, not worth it, and potentially deadly. Mmmkay?